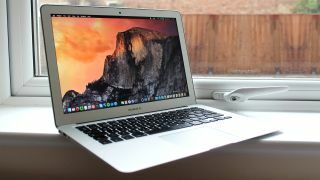 The MacBook Air will be refreshed very shortly, and we can expect to see the new models on sale in a couple of months according to the latest speculation. This new rumor comes from Macotakara, the Japanese tech blog that's a source of plenty of Apple-related chin wagging, and it cites a Chinese supplier which reckons the refreshed MacBook Airs will be shipping in August. Apparently, we'll also see the plug being pulled on the smallest 11-inch model, as has previously been speculated – and a 15-inch model will allegedly be introduced. Given the close timeframe for shipping, you might then expect an announcement about the laptops at the imminent WWDC, but Macotakara notes that it isn't clear whether Apple will reveal the new MacBook Airs at its conference. There will apparently be an announcement this month, though, but if it doesn't happen at WWDC – and it's just a simple press release issued later in June – that would indicate a pretty minor refresh. Although this would seem to be at odds with the theory that Apple is engaging in a major rejig of the range, dropping the 11-inch Air and bringing in a 15-inch model. This is all a little confusing then, and the waters are further muddied by Macotakara's assertion that the new MacBook Pro will also be unveiled at the same time as the MacBook Air. However, other rumor mongers have pegged the MacBook Pro as being released in the last quarter of this year, and if that's true, it would seem just a tad early for a reveal at this point. The Pro will boast some considerable changes according to the grapevine, with it reportedly being much slimmer and lighter, benefiting from a new metal injection molded hinge. Apple is apparently adding an OLED touchpad to replace the top row of function keys (allowing for users to customize these keys as they wish, so they can for example tie one to launching a specific app). The laptop will also run with four USB-C ports, at least if leaked images are on the money. As ever, there's still a lot of guesswork at this point, but matters will hopefully become clearer very soon when WWDC comes to town.